Each temple was dedicated to one Hindu divinity. 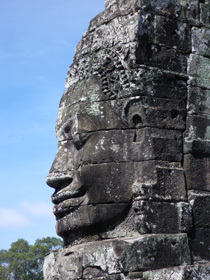 The early Khmer kings worshipped Shiva, the god of regeneration and destruction, until the early 12th century when King Surya-varman II built his temple-mausoleum of Angkor Wat dedicated to Vishnu, the god of preservation. The accession to the throne in 1181 of King Jaya-varman VII, a Buddhist of the Mahayana school, marked a radical change, with the building of Buddhist temples and monasteries throughout the Angkor region, filled with statues of Buddha instead of representations of the Hindu mythology. Mahayana Buddhism, also named Greater Vehicle, is a later version of Buddha’s teachings that spread in Northern Asia. 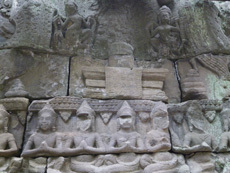 On his accession to the throne in 1243, King Jaya-varman VIII a fanatic Shivaiste, proceeded to a systematic defacing of Buddhist sculptures in the temples or crudely altering them into Hindu images (visible at Ta Prohm and Preah Khan). He was deposed in 1295 by his son-in-law, Sindra, a devoted Buddhist. 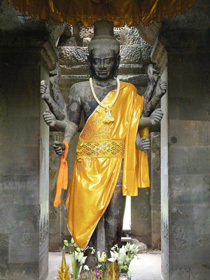 Second form of Buddhism introduced in 1295 by King Sindra, and the dominant religion in Cambodia today. 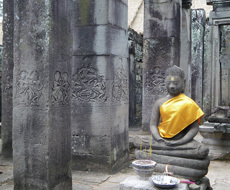 Theravada Buddhism, also named Little Vehicle or Teaching of the Elders, is an earlier form of Buddhism that originated in Sri Lanka and spread in Southern Asia (Cambodia, Thailand, Myanmar, and Laos). Unlike Mahayana, it is the individual’s own responsibility to reach nirvana through meditation and the acquisition of merit by giving food to monks, making donations to pagodas and worshipping the Buddha. Neak Ta are guardian spirits of the land and of the water. 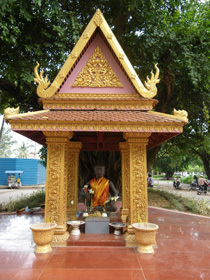 They are revered everywhere in Cambodia, along with Buddhism. 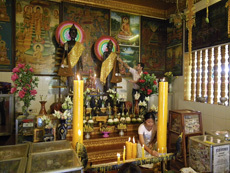 Every village, city district, pagoda and individual house have their own Neak Ta residing in a beautifully decorated little shrine, where people come to pray and make offerings.